Multi traceratope is a multicurrencies and multitimeframes indicator that catch the main trend and a good point to enter it in order to "scratch pips from the wall". You will se GREEN or RED timeframe when signal is triggered on specific timeframe. It's possible to click on a specific timeframe related to a specific symbol to switch to that chart. Identifier of indicator: this is an ID that need to be used if you use multiple instances of indicator on the same MT4 platform. The indicator uses Global variables. There is no need to use multiple instances of this indicator within same platform but, if you want to do that, change this ID for each instance. Symbols: comma-separated list of symbols that you want to analyze in the indicator (empty: only current symbol). Max of symbols in one column: self-explaining. 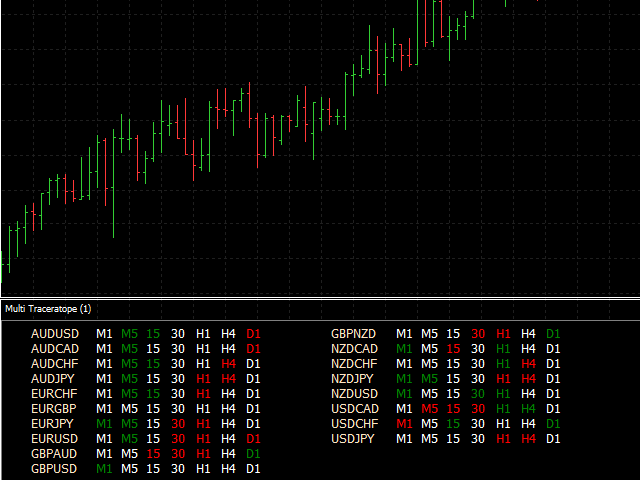 Logs state change in journal: write logs when signal is generated on the MT4 journal. Fast MA Periods: periods for FAST EMA. Slow MA Periods: periods for SLOW EMA. WPR Periods: periods for WPR oscillator. BUY Threshold: (for WPR oscillator) values below this value are considered good for BUY. SELL Threshold: (for WPR oscillator) values above this value are considered good for SELL. For EA use: It has one buffer that provide 1 for BUY and -1 for SELL. If you need further information about EA integration, please write me. I'm also working on an EA based on this indicator, it will arrive in next days!